I had an issue with the shipper for my clamps. One of the boxes was damaged and missing clamps and Grizzly was very fast to replace them. I cant recommend their customer service any higher. The clamps themselves are of good quality. The clamps are cast and very sturdy, the bars are machined and the threading is very deep and should be very strong. The clamps have plastic caps on the end that can be removed or replaced with leather, but they are thick, good quality plastic and fitted very tightly. The screw portion of the clamp is of good quality and is very smooth when screwing. The flat part of the screw clamp tip is solid steel (I have seen some clamps with hollow tips that use the cap for even pressure but have a tendency to mar the wood). The grips are solid wood and don't feel loose or fragile at all. 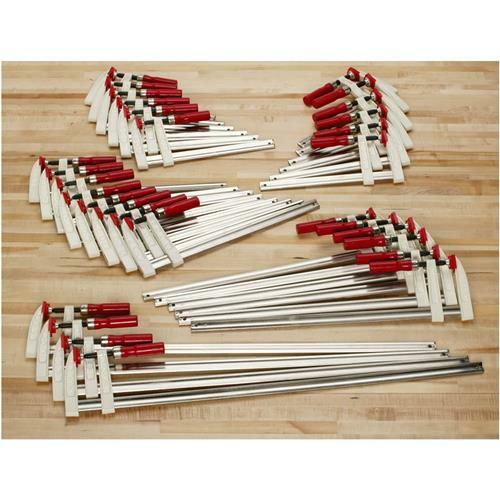 Great purchase for the money, and while there are certainly better clamps out there, the value is certainly here if you need a bunch of clamps. This is a lot of clamp for the money. The handles give you the ability to give plenty of pressure, and the steel bar feel sturdy. The plastic clamp pads it comes with are a bit of a joke, so I'd recommend either buying some aftermarket ones, or just make your own cauls as needed to protect work surfaces. high quality and will be using most of them on my next project. I bought this set about 2 weeks ago and it has been in heavy use since I got it. The pad fell off of the screw on one of the 18&quot; clamps, and the head broke clean off of one of the 12&quot; clamps... too bad I can&#39;t upload a picture. I&#39;ll send one to customer service and see if they replace the broken clamps. Other than that they seem nice... very little deflection when used with high clamping pressure,...the pads do leave red marks,... but no dents.<br /><br />If you need the pressure point to be perfectly square and flat, .... these are probably not the clamps for you... if you need lots of clamps at a low price,..these are just the thing. This is a great assortment of clamps for those who either are just starting out, or would like to extend his/her clamp collection. 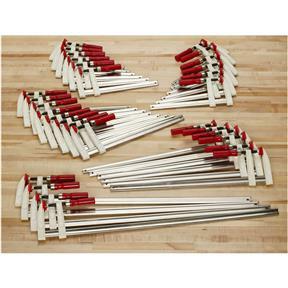 There is no such thing as too many clamps, and these represent a well balanced variety of sizes. They are all heavy duty, with wood handles, and plastic cauls. As for functionality, well, it is an F-Clamp and works just like an F-Clamp. Smooth operating and endlessly useful. The only issue that I have had with them is that the plastic cauls on them are very, very marring. Depending on what you are clamping up, you will likely want to use some sort of sacrificial wood as a caul, as to not get reddish-orange marks on your wood. Again, it is a minor issue, ultimately. For most applications, you are likely to be using some sort of purpose-built jig or caul, anyhow.